Portsmouth have allowed defender Linvoy Primus to re-join former club Charlton on a three-month loan. The Addicks wanted to take Primus, who started his career at the club, on a season-long loan to cover for Madjid Bougherra's departure to Rangers. But Portsmouth boss Harry Redknapp called off the deal after saying the 34-year-old was part of his long-term plans at Fratton Park. Primus has not played a league game for nearly 18 months after knee surgery. Pompey were happy to let the 34-year-old regain full match fitness in a spell at the Valley as the Addicks target a promotion push from the Championship. 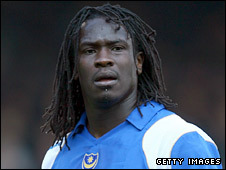 Primus told the Pompey website: "It's good. I have a connection to Charlton and I'm going to be close to my family. "It's a great opportunity for me to play at a high standard, with a club who have ambitions and are moving forward. "It's a chance for me to get match-fit and to play regular football, which I need to do.